Digital Transformation is a pillar to build on a remarkable legacy with an unwavering commitment to academic excellence in today’s era. These digital technologies can be optimized in a different arena including research, seed funding, infrastructure development, and more. A huge investment is needed for sustainable implementation and execution of these technologies in Higher Education. Institutes do not have such high investment capacity and in order to transform the academics, a few institutes capitalized the power of digital media. The Baylor University, Texas followed the same path and run an exhaustive campaign to raise funds for research, capital projects, academic projects, scholarship projects and more. This campaign highlights how they have planned the idea and implemented across the world leveraging digital media. To raise Give Light is a $1.1 billion comprehensive campaign for the future of Baylor University. The campaign undergirds Illuminate, the University’s Academic Strategic Plan. To impact every aspect of campus life, from academics and athletics to student life and global engagement. Run campaigns highlighting the future of Baylor, sustainable research and faculty development. Created a compelling portal of information. Set campaign funding projects and priorities and architectural 3D render of upcoming capital projects. To leverage social media platforms to connect with a donor. Showcase Donors on the social media handlings as well as on the website. The objective of the campaign was to raise a fund of $1.1. billion that will impact every aspect of campus life including academics and athletics to student life and service learning. They were able to generate a very huge sum of money approximately $600 million and still going on. The approach was very clear with leveraging social media platforms to connect with donor and showcase their gift on the social media as well as website. It makes a proud feeling for a donor to support a social initiative, where their money is being the investment for the betterment of students and faculty. 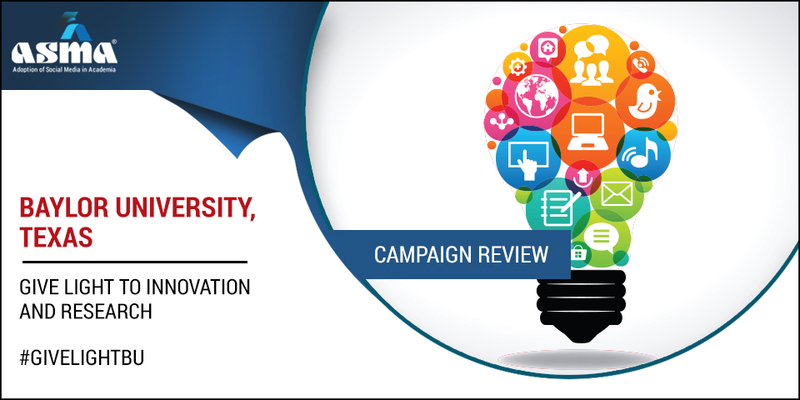 Learn more the efforts of prioritizing the need of campaign on digital platforms. The campaign has started with creating a compelling portal of information, where all the relevant pieces of information about the projects have been shown. They have provided a categorization of priorities (projects they want to implement) and why they want to raise fund under these categories. Donors are at their free will to donate any amount for any categories of priorities. They have pre-decided the projects for which funding is needed. These projects are self-explanatory and provided with relevant information for a donor to understand the objective behind such projects. Another aspect of such well-executed campaign is, they keep on updating their audience regarding the progress they have made till now. How many donors have been participated, how much funds they have received till now and more? The university had a great vision to leverage the power of digital media. Their entire campaign has aimed to connect dots, bridge the gap between institute and donor. And they succeeded in achieving the set objectives. With over 2 lakh likes on its Facebook page, it has kick-started the campaign on Facebook to reach out to the target audience. The posts have been flooded with the beautiful architectural 3D render, presenting an overview of projects and these short videos offer a look at what this new facility could look like following a successful campaign. Such articulated 3D visualization brings a new light to the projects and able to attract donors. More important to look at the beauty of the post, where apart from video, the descriptions are in line with the objective of the campaign. The cross-link of the campaign page has been provided in each post, to give the audience an aesthetic understanding of the entire campaign. With more than 37K followers on Twitter, they have raised the campaign on Twitter to create awareness. The retweets of #GiveLightBU has accelerated the overall growth of the campaign. The post contains the launching of the campaign, the objective of the campaign including the link to understand the full context of the campaign. The twitter posts have also included the portion to highlight the donors, appreciating the efforts of the donor for the betterment of BU. A big thank you note for donors on social media. The strategy makes it clear to appraise donors and attract others to contribute for Baylor. A user-generated cross promotion posts are also being shared giving thankyou note for donors. It is important to analyze that faculties and Students of BU promote the donors on twitter, it gives a sense of belongingness and sincerity for donors. On LinkedIn, users are very active to share the post of the campaign, gives 3 times higher engagement rate. Baylor cross-promotional strategy to reach target audience over LinkedIn has headed in right direction. Baylor has opted for YouTube promotional strategy, an art of storytelling about the future of Institute with the support of funds have been promoted in form of short videos. They have raised 549.3 million until November 30, 3018.